The City of Hartsville provides residential garbage pickup as well as recycling pickup. Green roll carts are for garbage and are supplied by the city. Blue roll carts are for recyclable materials and can be requested by calling Environmental Services at 843.383.3019. The City of Hartsville has designated days for pick up of trash and recyclables once a week. The City offers a mobile app, called “Hartsville Sanitation Services,” is available for smartphone users. The free service will notify customers of trash pick-up schedules, recycling, and any changes in service. Users can customize their accounts and notifications. Additionally, users can print their collection schedule and download it onto most electronic calendars. The app also contains a “Waste Wizard” that makes it simple and easy to look up whether a material or recycligbale or how to dispose of special thinks like oil and electronics. Residents wanting to utilize the notification system without readily access to smartphones or computers can contact Environmental Services at 843.383.3019 to sign-up for phone call notifications.The city offers the Hartsville Sanitation Services app, available on the Apple App Store or Google Play Store. You can also use the lookup tool below to find the schedule for your address. Roll carts should be placed at the curb by 7 a.m. on the day for your area. Backyard garbage pickup is available to the elderly and disabled homeowners with written verification from their doctor when no one in the home is able to assist in the placement of the cart at the curb. The doctor’s explanation should include the name and address of the resident and can be faxed to 843.339.2880. Please contact 843.383.3019 to report damage to roll carts and recycling bins. Sonoco Recycling, a unit of Sonoco, accepts materials from the City of Hartsville’s recycling program. The company collects over 3 million tons of material each year. 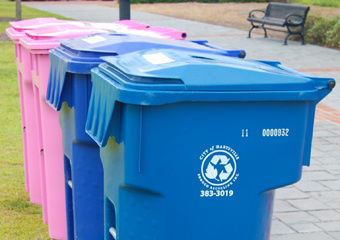 Recycling bins and roll carts are emptied at the curb bi-weekly on the same day as garbage. Recycling should not be bagged in any type of plastic bag or it will be rejected by our recycling partner. Use the Waste Wizard below to look up other items, or have the family play the Waste Sorting Game to throw some fun into the mix. Download the 2019 Sanitation Schedule here. Collection routes typically run every 7 to 10 business days, except during leaf season (December – February). Limbs should be no more than 3 inches in diameter and 6 feet in length. Yard waste must be kept separate from other trash and placed at the resident’s or business’ front property line. Raked leaves can also be placed at the front property line in one pile for collection, but must be separate from other types of yard debris. Bricks, rocks, concrete, dirt and construction material cannot be collected. Yard debris is not to be placed in or on any storm drain, gutter, street or sidewalk. Guidelines and current scheduling may be obtained by calling 843.383.3019. Box springs, mattresses, chairs, and tables cannot be set out for regular pickup. Please call 843.383.3019 for a pickup schedule and fee. The City will not collect white goods such as refrigerators, washers and dryers, or stoves. Computers, monitors, printers, microwaves, and televisions cannot be placed in the garbage for collection. These items may be taken to any Darlington County Recycling Center for disposal, or may be picked up by Environmental Services for a fee. Call 843.383.3019 for pricing and scheduling. Other small household items such as toasters, hairdryers, etc. may be placed in the garbage for disposal. For more information, visit the S.C. Department of Health and Environmental Control’s website on electronics disposal, which includes a list of local drop-off sites. Wheels for Wishes provides an opportunity to donate cars to benefit Make A Wish.